Starting with v16.2.0.x, if you reference Syncfusion assemblies from trial setup or from the NuGet feed, you also have to include a license key in your projects. Please refer to this link to know about registering Syncfusion license key in your ASP.NET application to use our components. The procedure that are followed in manual integration process is entirely automated when creating an application using Syncfusion Project template. 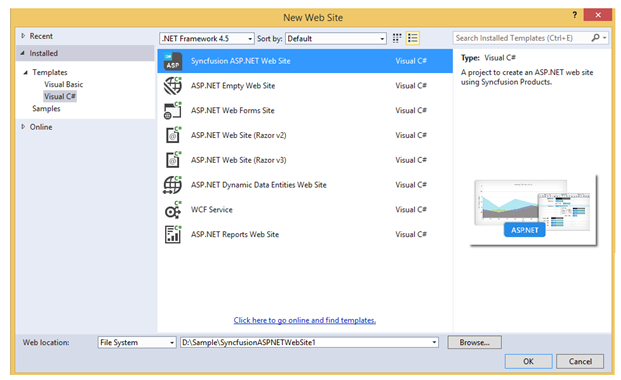 Click Syncfusion Menu and choose Essential Studio for ASP.NET (Essential JS 1) > Create New Syncfusion Web Project… or Create New Syncfusion WebSite Project… in Visual Studio. 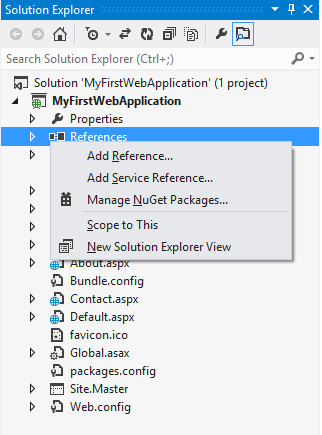 Choose File > New > Project and navigate to Syncfusion > Web > Syncfusion ASP.NET Web Application or Syncfusion ASP.NET Web Site in Visual Studio. Choose Templates > Visual C# > Syncfusion ASP.NET Web Site. Set a name and location for the project. Add your required controls in the ASPX Page. The code for adding DatePicker control within the “Default.aspx” file are as follows. Another way of adding control into the Default.aspx page is by making use of the Toolbox option present in the Visual Studio. You need to just drag the required control from the toolbox and then drop it into the Content section of the Default.aspx page, and the required control code will automatically gets generated. Finally build and run the project by pressing F5, so that you can now see the output similar to the following screenshot in your web browser. The Script Manager is mandatory in order to place our control initialization script in the page. Ensure whether the “ScriptManager” is added in the “Site.Master” or else add the “ScriptManager” to your web page. You just need to drag the “ScriptManager” from the toolbox under the “AJAX Extension” and then drop it into the Content section of the Default.aspx page, so that the required scripts to initiate our component will be added to your web page. Refer to the Embedded Resources section for more information on automatically loading script files from assemblies. The following structure is maintained for ASP.NET platform NuGet packages from 2015 Volume 2(v13.2.0.29). 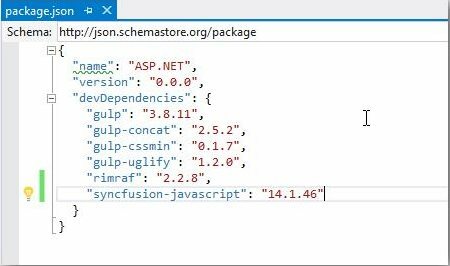 The latest package cannot be updated because of the installed Syncfusion NuGet packages prior version of 2015 Volume 2(V13.2.0.29). 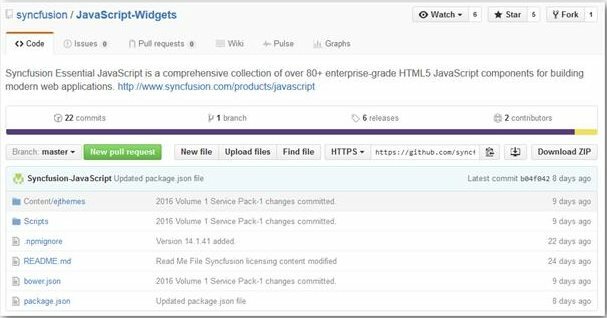 To update Syncfusion NuGet packages latest or above version of 2015 Volume 1 Service Pack-2(v13.1.0.30), uninstall the existing packages and install the following required package manually. To know more information about the controls for above categories navigate to the following link. To configure the Bower in your machine you need to install node, npm and git. For more information about configuring the Bower package, please refer to the official site for bower. Perform the following steps to install Syncfusion Bower Package via command prompt in your web application. Then run the command Bower install . To install a particular version of a Bower package, you need to provide the version as suffix of the package name while installing. For example, run the following command to install the package of version 13.3.0.18. 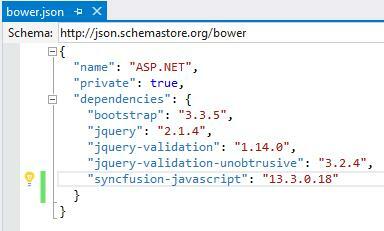 In another way, you can add the packages to the bower.json file by simply specifying the package name. This will install/restore the packages to your project. Please refer to the following image. You can install the Syncfusion Bower package from a local directory. To perform this follow the below steps. Then run the installed command by providing the package content’s location. To configure the npm, install the Nodejs and update the npm. For more information to configure the npm packages, refer to the official site of npm. Open project’s location in command prompt window. Run the installation command for npm. As per standard Syncfusion uses the 3 digit version for npm packages. To install a particular version of npm package, provide the version as suffix of the package name while installing. 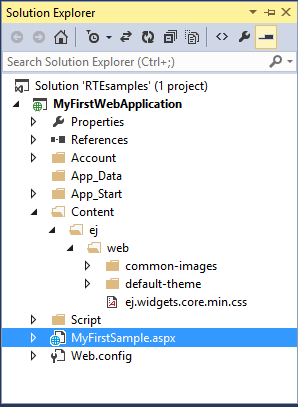 ASP.NET 5 (preview) projects have package.json file by default. Visual Studio project does not have package.json file, so run the following command using the project command prompt. Run the install command by providing the package content location. Run the following command to update the npm package globally. Run the following command to update the package by local location. JSPM is a package manager for SystemJS universal module loader, built on top of the dynamic ES6 module loader. This can load any module format (ES6, AMD, CommonJS, and globals) directly from any registry such as npm and GitHub with flat versioned dependency management. Any custom registry endpoints can be created through the Registry API. As per standard Syncfusion uses the 3 digit version for JSPM packages. To install a particular version of JSPM package, need to provide the version as suffix of the package name while installing. Update all the installed packages by using following command. Update specific package by using following commands. This topic mainly focuses on how to integrate the Syncfusion ASP.NET controls manually into the newly created/existing ASP.NET Web Forms application. Let’s look onto the procedure for making use of any of our ASP.NET controls within the ASP.NET Web application. Start the Visual Studio. Create a new Web Forms application by selecting File -> New -> Project and save it with a meaningful name as shown in the following. 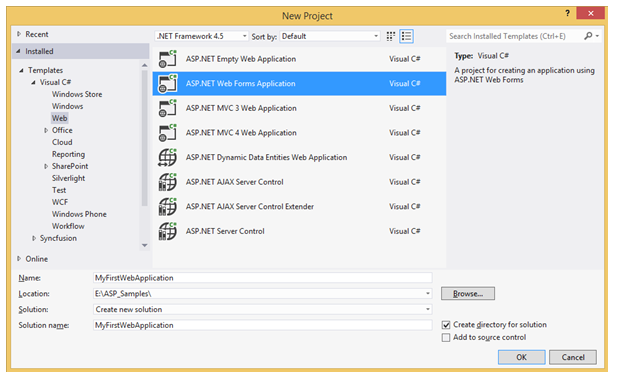 ASP.NET Web application is created successfully. Now you can build and run your application by pressing Ctrl+F5, it shows something similar to the following screenshot in your web browser. You have successfully created your first simple ASP.NET web application and now it is time to add some other essential things to your application that allows you to make use of our Syncfusion ASP.NET controls into it. If you want to add our Syncfusion ASP.NET controls into your existing application, open your existing application and proceed with the following steps. 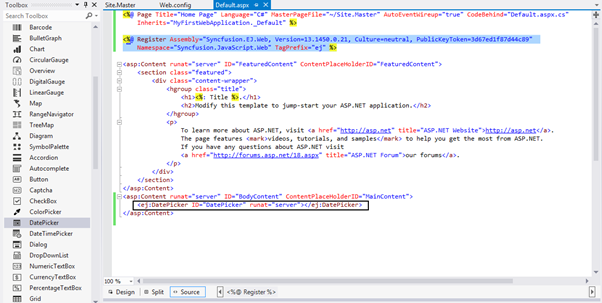 To render the Syncfusion ASP.NET controls with its unique style and theme, it is necessary to refer to the required CSS files into your application. 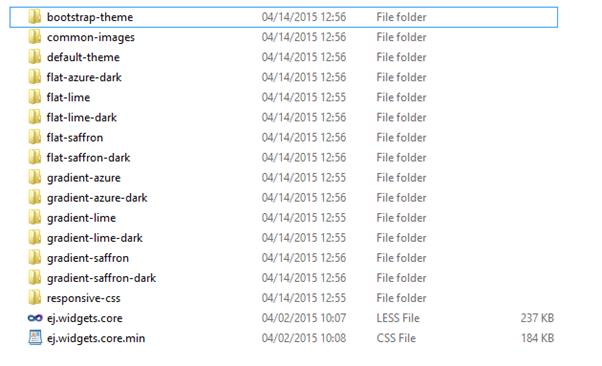 You need to copy all the required CSS files into your application from the following location. When you navigate to the above location, you can find the files shown in the following image that you need to copy entirely and paste it into your root application. Before pasting it into your application, create a folder structure with names ej/web within the Content folder of your application and place all the copied files into it as shown in the following. The common-images folder is needed to be copied into your application mandatorily, as it includes all the common font icons and other images required for the control to render. Once the CSS files are added in your application, include the reference to “ej.web.all.min.css” file in the Site.Master page, within the head section. jQuery (version supported from 1.7.1.min.js to latest jQuery version). Apart from the above common scripts, it is also necessary to refer to the ej.web.all.min.js file in your application that plays a major role in control creation. 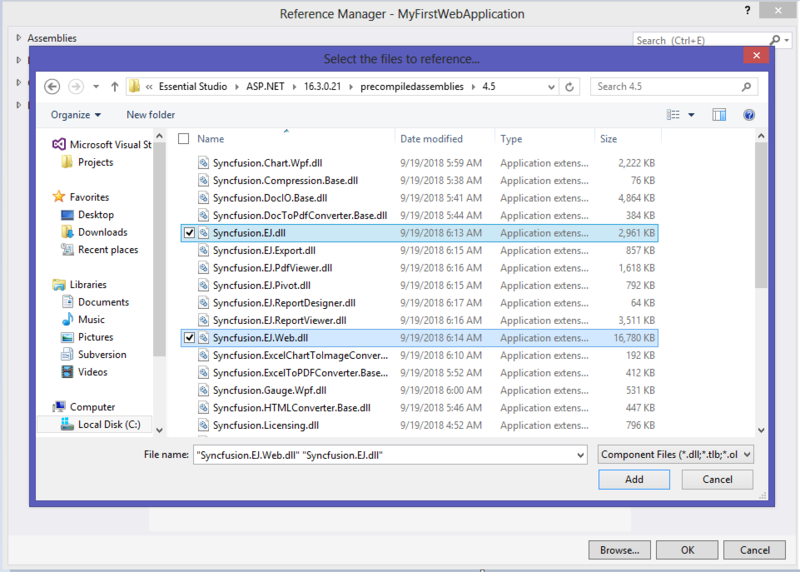 It also requires reference to the ej.webform.min.js file in your application, as it is responsible for the server-side event functionalities of the ASP.NET controls. The dependencies are available in the following locations of your machine. Please copy these files from the location given. 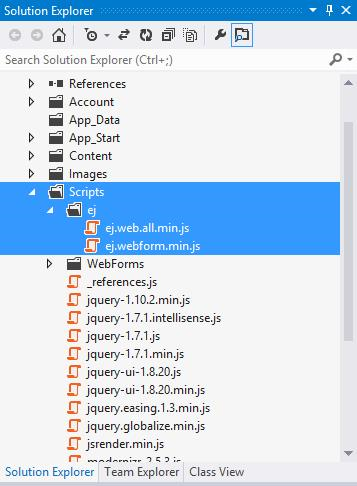 Now, create a folder named ej under the Scripts folder of your application and place the copied files ej.web.all.min.js and ej.webform.min.js into it as shown in the following. Once the scripts are added in your application, now it is necessary to include the reference to it in your application. This should be done within the Site.Master file, as we did previously for CSS files. Add the following script references in the Site.Master file within the head section. As the above mentioned order, the script file of ej.webform.min.js should be referred at the last, that is whether we use individual script reference or ej.web.all.min.js script reference. If you want to refer to the CDN links instead of the direct script and CSS references in your application, you need to make use of the following references in the Site.Master file. Drag and drop the control from the toolbox. Manually using the control code. An easy way of adding control into the Default.aspx page is by making use of the Toolbox option present in the Visual Studio. When you install Essential Studio Package or ASP.NET setup in your machine, all the available ASP.NET controls are automatically configured into the Visual Studio Toolbox. You just need to drag the required control from the toolbox and then drop it into the Content section of the Default.aspx page, so that the required control code gets generated automatically and also the required dependent assembly get registered automatically. When you drag and drop the DatePicker control into the Default.aspx page, the page looks as the image shown in the following with the automatic control code generated and the required assemblies registered. If you want to add the control code manually, follow the below steps. 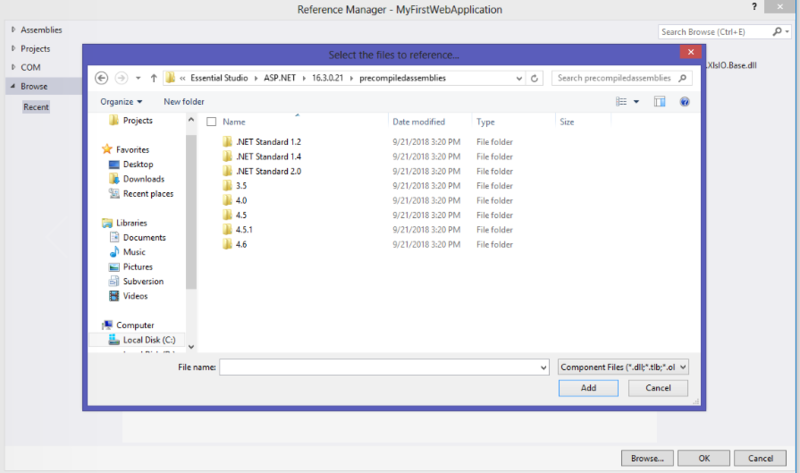 Refer to the following assemblies in your newly created ASP.NET application that allows you to use any of the Syncfusion ASP.NET controls within it. The reference to the Syncfusion assemblies can be added to your application in either of the following ways. Once you have installed the Essential Studio package in your system, the Syncfusion assemblies are automatically registered in the GAC. You can easily add the reference assemblies to your project by choosing Add Reference option as shown in the following. Now the Reference Manager pop-up will appear on the screen. In that pop-up, select the required assemblies from the Extensions tab as follows, by choosing the appropriate versions (13.1450.0.21). The version to be chosen for the reference assemblies is based on the Framework used in the application. Add the reference assemblies to your project by choosing Add Reference option as shown in the following. For example, If you have installed the Essential Studio package within C:\Program Files (x86), navigate to the following location. In the above image, the folders 3.5, 4.0, 4.5, 4.5.1 denotes the .NET Framework version. Based on the Framework version used in your application, you can choose assemblies from the appropriate folders. The Syncfusion.EJ.Web and other assemblies like Syncfusion.EJ are available within these folders. Add the Syncfusion.EJ and Syncfusion.EJ.Web assemblies to your application from the following specified location. Once the assembly selection is done, click OK to add the selected references to your project. You can view the assembly references added to your application, in the solution explorer as shown in the following. 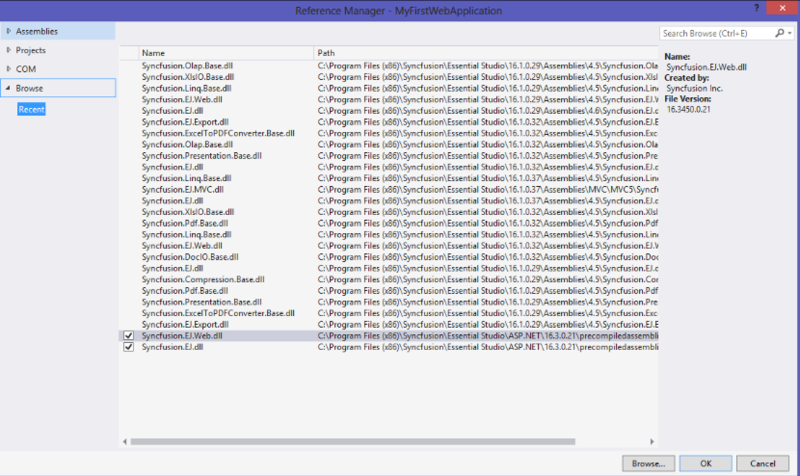 We have removed dependency for Syncfusion.Core assembly since v13.2.0.29. If you are using the latest version, this assembly is not required in your application. Refer to this KB document for more details. In your application’s web.config file, add the following assembly information within the tag. Add the following DatePicker code within the Default.aspx file, as shown in the image following it. Add the DatePicker code within the Content section, by removing the unwanted code within it. Also register the required assemblies within the Default.aspx page at the top where you are using the control as shown in the following. Thus the DatePicker control is rendered successfully with its default appearance. You can then use its various properties to set its value and also make use of its available events to trigger when necessary.